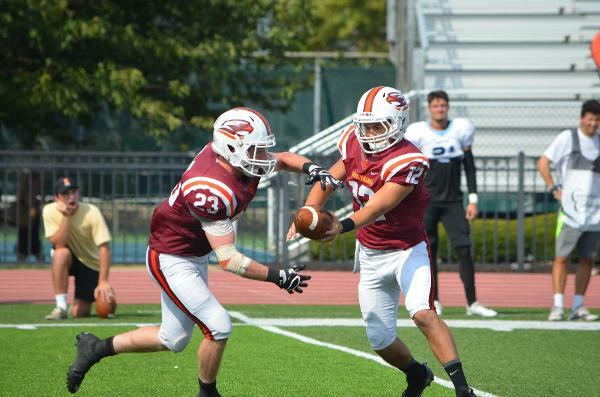 THE STORYLINE: The Susquehanna football team held off a persistent Dickinson squad to win 31-24 on the road. It marked SU’s first win of the season while the Red Devils remain winless. TEAM RECORDS: SU is now 1-2 on the season with a 1-1 mark in Centennial Conference action. Dickinson falls to 0-3 with an 0-2 mark in conference games. OFFENSIVE EXPLOSION: The River Hawks’ 31 points are the most since scoring 44 against McDaniel on Nov. 7 of last year. SU put up 443 yards of offense, 288 of which came via the pass. IT WASN’T ALL ABOUT THE OFFENSE THOUGH: The Susquehanna defense had three picks and seven sacks. Dickinson managed only 17 first downs, 274 yards of total offense and went just 1-for-2 in the red zone. TURNING POINT: Since SU led from start to finish, one could say Evan Argiriou’s 25-yard field goal at the 9:43 mark of the opening quarter was one of the critical plays of the game. His field goal was followed by back-to-back Susquehanna touchdowns that gave the River Hawks a 17-0 lead. While Dickinson pulled within seven twice in the contest, that 17-point cushion proved to be enough. CAREER FIRST: Freshman quarterback Bobby Grigas made the first start of his collegiate career. He finished 14-for-22 for 217 yards, one touchdown and zero picks. He also rushed for 18 yards and another score. RECEIVING GAME: Despite missing the 2015 Centennial Conference Rookie of the Year Diamente Holloway due to injury, SU still put up 288 passing yards. Tommy Bluj had eight catches for 121 yards while Chris Beals caught six balls for 100 yards and touchdown. Cameron Ott, in addition to his team-leading 65 rushing yards, caught two balls for 30 yards and one score. DEFENSIVE LEADERS: Marc LeDrappier had 10 tackles (four solo) to lead SU. He also added a half sack. Juwan Rodriguez followed with eight tackles and a game-high 2.5 sacks and 3.5 tackles for loss. Five other players accounted for Susquehanna’s remaining sacks. ConnorThompson, Ryan Ganard and Danial Shelton all came up with picks. SPEAKING OF GANARD: Ganard’s pick came midway through the first quarter when he picked off Dickinson quarterback Billy Burger at the SU 15-yard line; Ganard proceeded to return the ball 29 yards. KICKING GAME REMAINS STRONG: Senior Dylan Jenkins averaged an impressive 63.2 yards per kickoff with three touchbacks. He also averaged 34 yards per punt with a long of 43. BACK-TO-BACK: SU has now beaten Dickinson in back-to-back years. WHAT’S NEXT: SU returns home to host Gettysburg on Sept. 24 at 1 p.m. Saturday marks Coach to Cure MD (muscular dystrophy) day across college football.